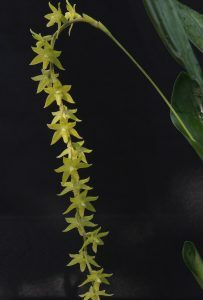 We are delighted to have a range of dendrochilum species in our collection and one of the most attractive is this species from Java. Plants grow in montane forests from 700-2000m and so should not be too fussy about temperature. We find the species does best in our Warm Asia section with a minimum of 17C where we keep plants shaded all year and well watered. Next month our dendrochilums will dominate the Warm Asia section with our monster plants of Dendrochilum cobbianum and Dendrochilum magnum so this species flowering has caused lots of excitement amongst our young growers. 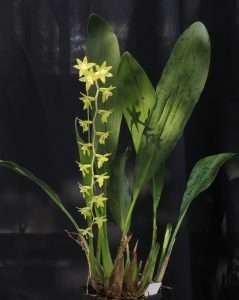 Is this one pollinated by midges like Dendrochilum Filiforme or is it another insect? It looks like it might be bigger than Filiforme but it is difficult to tell from the photo. It is a very lovely plant!